Beautiful ice pillars brighten a frigid night in Northeastern Ohio. When the air is especially cold and conditions just right, ice crystals form and, suspended in the air, can do amazing things. 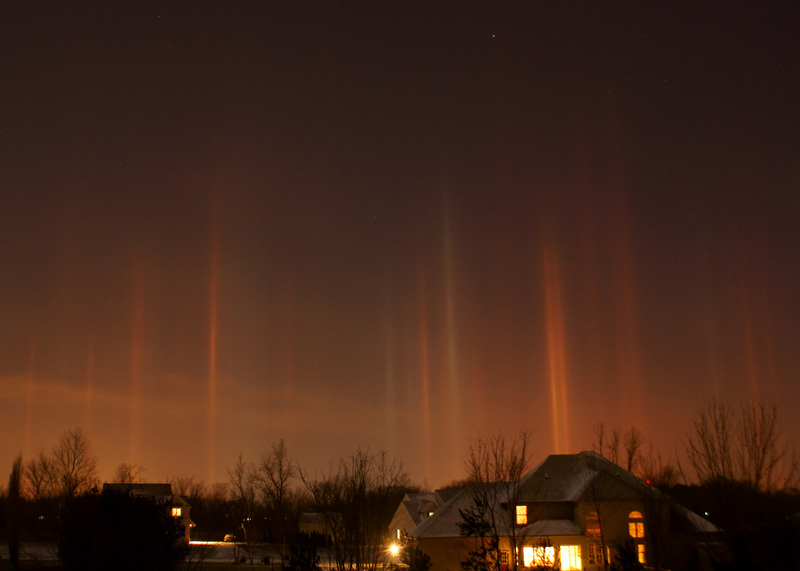 This night (January 22) tiny plates of ice reflected artificial lights to make a brilliant display of ice pillars. CAA member Matt Franduto witnessed the show and braved single-digit temperatures (~7 degrees F) to record the scene. Ice pillars are often mistaken for auroras (“northern lights”) which are a whole other kind of phenomenon. Notes: Sony A-500, manual focus, ISO 400, f/4.5, 8 sec., 18mm lens cropped. This entry was posted in Uncategorized and tagged astrophoto, ice, ice pillars, northeast ohio, northeastern ohio, photograph, sky, sky event. Bookmark the permalink.